How to converse respectfully about religion, how to share your religious beliefs in a respectful way that will help others to feel comfortable. Sometimes it seems to me like some people take for granted that religion is an inherently controversial or divisive subject. I do not believe this. I think that how a person approaches their religious beliefs, and how they present them to others, has a huge impact on how other people respond to them. On this page I will explain how I think people can share their religious beliefs in a respectful manner. Have you ever experienced someone who seemed to be pushing their religious beliefs on you? Has someone ever been pushy enough that it made you uncomfortable? Yes, this is something that I encounter often. Yes, but thankfully, not very often. No, it's never happened to me! Forcing your beliefs on someone sounds like a bad thing, right? And sharing your beliefs sounds perfectly acceptable. I think most people would agree with these two points...but the problem is that people do not necessarily agree where exactly to draw the line between positive sharing of beliefs and disrespectful or obnoxious pushing of them on other people. Sharing uses "I statements" and keeps your beliefs personal rather than putting them forth as universal truth. Sharing your beliefs might be saying things like: "I believe in God." or "I don't agree with everything that the Catholic church teaches." Pushing your beliefs on others aggressively might be saying: "God doesn't exist." or "The Catholic church is the one true church." or "The Catholic church is wrong." Sharing involves listening and interactively conversing with a person rather than talking at them. If someone is asking you questions about your faith, then it can be great to talk about it. But if you repeatedly bring up the topic of your religious beliefs when people don't ask, and you keep talking about them at length when other people have made clear that they're uncomfortable, you're being too pushy. Teaching your children about your religion is a great way of sharing your faith with them; forcing them to participate in ceremonies they don't want to is forcing your faith on them. There is nothing wrong with raising your children to have an awareness or familiarity of the religious traditions and teachings that you believe in or practice. This can enrich their lives and help their spiritual journey. But as children get older, if they voice that they are not interested in participating in certain activities, and you force them to by punishing them or even expressing disapproval if they don't, then you're forcing religion on them. It is very important for people to discover and embrace religion of their own initiative. 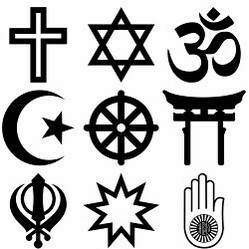 How often do you talk to people about religion who have different beliefs from yours? When someone says something you disagree with, ask them to explain themselves. Often, people seem to disagree not because they have fundamentally different beliefs, but because they use language in different ways. For example, people might use the word "God" to mean different things, because they believe different things about the nature of God. When someone brings up a point that doesn't make sense to you, ask them to explain and delve deeper--you may find that you agree with a lot of their underlying explanations, but even if you don't, you'll understand them better. Look for common ground. You won't ever agree 100% with what someone else believes, and this is especially true when talking to people with different belief systems. But if you focus on common ground, you will likely find that you develop a richer connection with the person and become better able to keep your dialogue positive. Be assertive about your own disagreement without forcing it on the person. When someone says something that you disagree with, it is okay, and even sometimes important, to be up front about the fact that you disagree. But you can do so in a way that respects the other person's perspective. Don't say things like: "You're wrong." or "That's wrong. ", but instead say: "I don't agree with that; I think..." or "I think about this differently...I believe..."
Be mindful of context. There are times and places where religious discussion is more or less likely to offend. Repeatedly bringing up religious topics in a secular workplace is likely to strike people as pushy, whereas the same way of presenting the same ideas might be perfectly acceptable in a group oriented towards religious discussion, or even a casual or personal conversation with a friend. If you sense that someone seems defensive, you can emphasize that you respect them as a person and respect their beliefs even if you don't agree with them. You can also express that you are grateful to them for giving you the opportunity to talk to them about their beliefs. You can also focus on common ground and try to steer the subject to points where you agree with them. It's possible that you can be fully respectful, but people will still take offense--don't take it personally! Religion can be a sensitive topic, and if you talk with enough different people, it's almost inevitable that you will encounter a situation where someone takes offense even though you did your best to be fully respectful of their views. Don't take it personally when this happens! In these situations, it is important to remember that you are not responsible for other people's reactions, and that just because someone reacts negatively does not necessarily mean that you've done something wrong. Does this mean it's good to stop talking about religion (even with this particular person)? Not at all! I think it is important to challenge people. Just because someone gets upset in the moment doesn't mean that they are going to stay upset. My experience is that if you are consistently respectful to someone, and don't take it personally when they get upset, most people will quickly get past this feeling so that you'll be able to have a more constructive dialogue with them. You may even be helping them to work through some of their own issues. This was a wise article. @cazort - First of all, I'd like to say Thank You for publishing my comment. (1) "Choice words are like apples of gold in pitchers of silver." I'm referring to your remark as "choice words". The fact that a person expressed disinterest already means the follower broached the subject and has obeyed the command. Time to move on. It's called "shaking the dust off your feet". I think this is an interesting question you raise. I think there is a problem with that line of reasoning though. I don't think it's "wrong" not to share something--especially if there is no way to share it without stepping over someone else's boundaries. (I.e. sharing something when someone has expressed that they're not interested in hearing it.) If you really want to share a religious idea, or a particular religious belief or practice with someone, and, like you said, you really think it would benefit them, then it's important that you present it to them in a way that they would be genuinely open to it. I think this is where respect is of key importance. Sometimes, if you share an idea or viewpoint in a way that comes across as pushy or disrespectful, it can make people close off to or reject ideas that they might otherwise like or agree with. I also don't think that choosing to not share specific information with someone is not the same as "keeping a secret". I think a lot of evangelism starts off backwards...I've seen a lot of people approach me or other people, trying to share their religious beliefs with someone else, before they really know much and understand much about what the person believes. I think this can actually be quite destructive--getting people to close off and often making them even more uncomfortable with the person and with the religion they represent, than they were initially. I think that ideally, if you want to share your religious beliefs with someone, it's more productive to start by asking someone what their beliefs are, and how they feel about religion. In many cases, the person will respond by expressing interest in your beliefs as well. This can lead to a respectful dialogue in which both people gain insight about each other's beliefs, and both people may be likely to grow, learn, and refine their beliefs somewhat as a result. @cazort - If a person has "good news" that would benefit everybody wouldn't it be selfish for them to keep it a secret? More than selfish, it would be just plain wrong. So from the point of view of a faithful disciple, the person who they share the message with has the option to disregard or ignore them, or receive it. But the disciple doesn't have the option to withhold the message. They've been commanded to reveal it. Not force it or threaten with it or demand obedience to it. The disciple does not get to pick and choose and judge who is worthy to hear the message. The good news is for all. That's how it is in Christianity. I can't speak for other religions or non-religions or whatever. I find it really interesting how you talk about switching from being "Christian" to being "atheist" but being stuck in a similar mindset. I think in some ways there's a parallel between certain ways of thinking, and things like addiction. I'm not saying that religion is bad or atheism is bad, just that the brain can get into certain mindsets, like how when someone quits a drug like cocaine and then gets into another addiction, like gambling. But I think religion is usually better than things like cocaine or gambling, just that people can get into an unhealthy state about it. I really like organized religion, I like the community that can center around both churches and non-theistic belief communities like a philosophical discussion group. But I think that some communities can get into unhealthy mindsets. One of the things I've been trying to do with Why This Way is build a belief system where the beliefs themselves and the culture of the organization and the community all work together to help keep people in healthy ways of thinking that don't tend towards judgmentalism and the sort of us/them mentality that I encounter in some groups. It's a challenge but so far it seems to be working really well; we've brought people in with vastly different belief systems and we seem able to discuss a whole bunch of different topics and maintain a respectful atmosphere, which is awesome! I think "living" only truly happens when you live in the gray. When I was younger, I was a "Christian." When I got out of high school, I was an "atheist" and am embarrassed how hard I got stuck in that mindset and "absolute truth." But in the gray is when my sense of life purpose, happiness and growth really blossomed. Now I am very spiritual (not in an organized religion sense), in tune with nature, see beauty everywhere and am open to so much more living while on this physical part of my journey. This path doesn't involve believing in a god or arguing there is nothing...it is about finally being quiet on the inside and just letting my senses guide me along. I've really put black and white thinking behind me in many ways, and it is refreshing! If we believe we have the answers, then there is nothing left to learn - and life is all about the journey, all about the learning, isn't it? That's interesting, JoHarrington, that you remarked that someone assumed that you were Christian because you came to the defense of someone who was Christian. I've had a similar thing happen to me with Republicans and Democrats...someone assumes that I'm allied to one of these groups if I come to their defense. I think this is a classic example of what I call "all-or-none" thinking, when someone is thinking in rigid categories and the minute they see someone "siding" with one group on one issue or point, they label them as a member of that group. I obviously think this way of thinking is erroneous. I think it can take some subtlety or sophistication to see things as they really are, but I ultimately think it's worth doing so. I try to be as patient as possible when I'm dealing with people who are thinking in black-and-white categories about anything, whether religion, or politics. I don't want to judge, because I used to do a lot of this myself (and it's sometimes something I still struggle with, unconsciously). I do think that when people learn to get their brains of being stuck in one type of category (like believer vs. nonbeliever, liberal vs. conservative) it helps them to see all the nuances in other aspects of life and aspects of belief, and I think that leads to greater respect and understanding, and more satisfying conversations too! I've so encountered some of these just recently! There's been quite a flood of it, especially over the last month or so. I since learned that there's been a big push in America for Atheists to, well, evangelize. The faintly amusing thing is that not one of them have stopped to actually ask me what my religion, or lack thereof, may be. Because I was asking them not to attack a Christian friend, it was assumed that I was Christian. Nope, just someone who dislikes bullying and will step in to defend folk against that. Fortunately I have many, many Atheist friends who don't act like that. They're out trying to undo some of the damage that Dawkins et al are enleashing. I wouldn't judge a whole school of thought/religion/philosophy etc on the viewpoint of just one person pushing it anyway, but it was good to have an antidote in my 'old Atheist' friends. I hate anyone trying to force their views on others, whatever their standpoint, but I also love and will defend freedom of speech. It makes for some, ahem, interesting conversations! I was out all day! I generally don't check internet as much on weekends, and I do like to moderate comments. It's rare that I have a problem with spam or hostile comments, but in the cases that I do, when I am away from the internet for a few days, I'd rather not have the bad comments up! Hmm...I actually think the same advice can be used for atheists. Atheists and other non-theistic belief systems I think can go either way. I've seen people with non-theistic belief systems (atheism, objectivism) act in ways that I felt were pushy, so I do think some people need this part of the advice. But you bring up another really good point, which is that sometimes you aren't interested in hearing beliefs--especially if you've heard them before. Maybe I could add a section on this, but I think that an important part of dialogue is consent--that is, not talking AT someone if they don't want to hear what you have to say. I think it is disrespectful to do this. And I also think it's inefficient (i.e. it doesn't help either party learn or grow much). But I also think there are respectful and disrespectful ways to cut someone off if they're talking and you really are not interested in what they're saying. I don't believe interruptions are always disrespectful--sometimes I think it can be worse to let someone talk on and on, and then harbor resentment. It may seem a bit abrasive in the moment to cut someone off, but I think if you speak your mind and let someone know if you're not interested in what they say, but that you still value talking to them about other things, it can pave the road to a better overall connection with them, and greater levels of trust and understanding in the long-run.